Category Archives for "Blog Marketing"
The purpose of blog marketing is to build your email list. 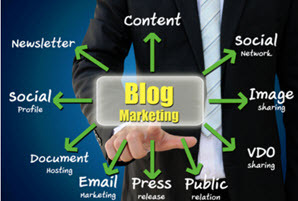 This is what the best online marketing blogs know and do. Yes, you want to build a relationship with your subscribers. Yes, you want to get listed in Google. Yes, you want other bloggers to link to you. But ALL of that takes place for one end result: Building your email list. You do that by placing opt-in forms on your blog. You can put these at the top, the side or the bottom, or all three. It’s not so easy to calculate now that mobile devices, iPads, and smart phones are taking more and more market share away from desktops and laptops. That’s one reason I currently have my opt-in form in my header of my blog. And just as I say that, last night I was deleting a bunch of old themes off my blog and accidentally deleted the theme I was using, which messed up my code. So at the second you’re reading this, I only have an opt-in form at the bottom. Anyway, when it’s all fixed up, my opt-in form will be at the top. The BIG ISSUE is not the “technology.” In the video below, I talk about how you hook up your opt-in form to your blog. Some people look to use optin form generators. For example, on this blog, I sometimes use Optin Skin. It’s basically an opt-in form creator, but it isn’t free. That’s why I have the video below for you, to explain how simple it is to put an optin form on your blog for free. The BIG issue is NOT “how to install optin forms” on your online marketing blog. The key is what you OFFER to get the opt in to start with. Is your opt-in lame as dirt? The BIG issue is WHAT you offer as your freebie to start with. At the moment you’re reading this, I’m offering The Best of Marlon Sanders ebook. That is great for people who know me but not so great for brand new people. I plan to come up with a more enticing and targeted freebie offer in the near future. And if you don’t have a good one, you should too! You can use a 2-page PDF if it’s a good one. Or an ebook. A video. Or a mindmap if you snagged Paul Myer’s Mindmap course. In the big picture, the most important thing is that you have opt-in forms on your blog and that you get visitors to it. Did This Help You? If you want me to write more info on this topic, then like, comment and share this post. Thanks. PS: Want to get your blog up and running, your opt-in forms installed, your plugins installed, your security handled, your blog’s speed checked, and visitors to your blog? Then check this out. And if you enjoyed this video and post, please retweet, comment and share, so I know to produce more like it.